This taro and tapioca pearl dessert is very popular around Asian areas, often served at Chinese restaurants after dinner. 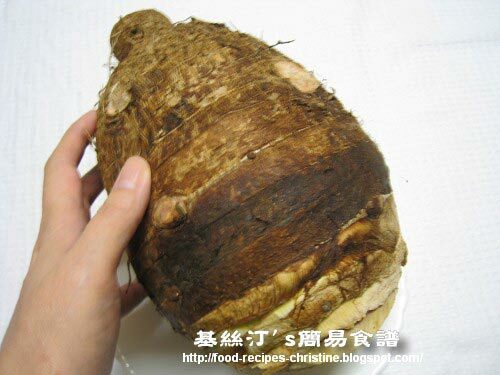 The taro is cooked just right and soft, and tastes wonderfully good with coconut sweet soup. 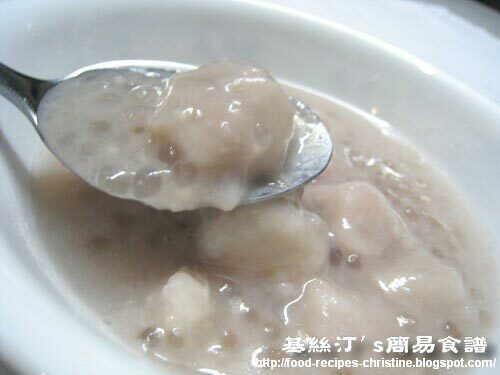 On the whole, cooking this dessert is not difficult, but cooking tapioca pearls is quite tricky. They would turn soggy if overcooked, or else the middle part is not cooked through without enough cooking time. That is the hardest part of making the dessert. This taro was a present from my best friend. Is it big? Not only is this taro big, but also it's perfectly beautiful! Soak tapioca pearls over 3 hours. Add to the boiling water on medium heat. Stir them frequently and make sure that they don’t stick together. After cooking for 20 minutes, remove the pot from heat, cover and let sit for another 30 minutes. The tapioca pearls should be translucent, without any white dots in the middle. They are done. If they are not ready, turn on the heat again and cook for a few minutes more. And then let sit for a while again. Drain tapioca pearls and rinse under cold water. All tapioca pearls should be cool to the touch. Bring 1 liter of water and coconut milk to the boil, add diced taro. When the taro cubes are cooked half through, add rock sugar until melted, to your taste. Lastly, add cooked tapioca pearls. Done. This dessert can be served hot or cold. If you like it cold, simply chill the dessert for 3 hours before serving. 師母, 好好的介紹呀! 雖然我唔多吃香芋,但我好喜歡甜品, 等我試下整俾媽媽吃先, 因為佢好喜歡香芋架! 多謝晒啊! What a tasty traditional dessert! I'd like to share your recipe with our readers, please let me know if you're interested :). Happy Holidays! Welcome! What do you like to do? A link back or something else? You can add bananas the ones we are frying,sweet potaoes cubes,small amount of vanilla too and it's very yummy. How much water do we add to boil the tapioca? I boiled it, but the tapioca became sticky so is there a certain amount? Because of that, I had no idea how to drain them so I used the whole thing. And is it 1L of water you add to the coconut milk? The water portion is confusing because there is the soaking, boiling, then mixing. Help! For soaking, the water should be more than enough to cover the tapioca pearls. This helps tapioca to absorb as much water as possible. Drain well and discard the soaking water. For the boiling water to cook tapioca, use plenty of water to cook as you like. It doesn't matter how many. Just add enough and don't let the tapioca pearls stick together. If they stick together, add more boiling water to cook. Don't be panic. When the tapioca is cooked through, it turns translucent. Drain well. You don't need that water. 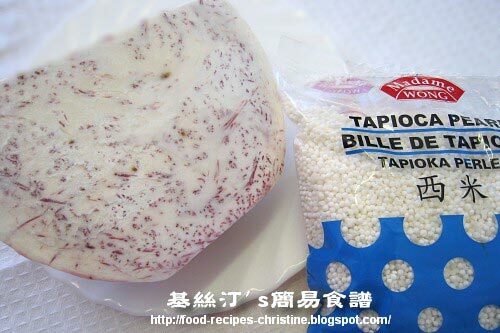 The purpose of these jobs that are mentioned in step 1 of this recipe is to prepare tapioca with excellent texture. At the very last step, you just add the cooked tapioca in the cooked taro cubes with coconut milk mixture. Cook taro cubes until half-way done, add sugar and the soaked tapioca (drained out excess water), stirring constantly, until taro softens and tapioca turns translucent. That's it. I will try it again next time! Hopefully it turns out better :) Thank you! Just wondering, how would you choose the best taro? Check their outside if they are good. Choose the light ones because they don't take long time to be softened in cooking. Is there anyway I could substitute mochi balls instead of tapioca? What can i substitute with taro? I am having difficulty buying it. You could try sweet potatoes. It would work too. Bring 1 liter of water and coconut milk to the boil. Before trying this recipe. My questions, if you boil the coconut milk, won't the coconut milk curdle and subsequently become rancid. And how do you choose a taro? I've in the past, I've purchased some bad taro (not pleasant to the taste bud, if you know what I mean). Hi,can i put half coconut milk n half fresh milk? Why not? As long as you like it, you can use any amount of coconut milk or fresh milk. Thanks christine for sharing. What type of coconut milk u use? I sometimes used canned coconut milk, sometimes the carton ones.